Van Fortress as seen from the northwest. Large sections of walls are still standing. The Fortress of Van (Armenian: Վանի Բերդ, also known as Van Citadel, Turkish: Van Kalesi or Kurdish: Kela Wanê‎) is a massive stone fortification built by the ancient kingdom of Urartu during the 9th to 7th centuries BC, and is the largest example of its kind. It overlooks the ruins of Tushpa the ancient Urartian capital during the 9th century which was centered upon the steep-sided bluff where the fortress now sits. A number of similar fortifications were built throughout the Urartian kingdom, usually cut into hillsides and outcrops in places where modern-day Armenia, Turkey and Iran meet. Successive groups such as the Medes, Achaemenids, Armenians, Parthians, Romans, Sassanid Persians, Byzantines, Arabs, Seljuks, Safavids, Afsharids, Ottomans and Russians each controlled the fortress at one time or another. The ancient fortress is located just west of Van and east of Lake Van in the Van Province of Turkey. The lower parts of the walls of Van Citadel were constructed of unmortared basalt, while the rest was built from mud-bricks. Such fortresses were used for regional control, rather than as a defense against foreign armies. The ruins of this fortress sit outside the modern city of Van, where they support walls built in the medieval era. 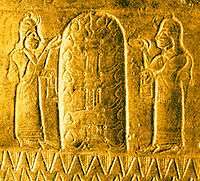 "A great god is Ahuramazda, the greatest of gods, who created this earth, who created that sky, who created man, who created happiness for man, who made Xerxes king, one king for all, one ruler for all. May Ahuramazda and the other gods protect me, my kingdom, and what I have made." When it was published by Eugène Burnouf in 1836, through his realization that it included a list of the satrapies of Darius (repeated by Xerxes in nearly identical language), he was able to identify and publish an alphabet of thirty letters, most of which he had correctly deciphered. Burnouf's reading of the Van trilingual inscription had made a significant contribution to the deciphering of Old Persian cuneiform. Silva Tipple New Lake led an American expedition to the ruins in 1938-40. Citadel with the ruins of the city of Tushpa below. The walls of the fortress (Russian Archeological Society, 1916). ↑ Burnouf, Mémoire sur deux inscriptions cunéiformes trouvées près d'Hamadan et qui font partie des papiers du Dr Schulz, Paris, 1836; Schulz, an orientalist from Hesse, had been sent out by the French foreign ministry to copy inscriptions but had been murdered in 1829; see Arthur John Booth, The Discovery and Decipherment of the Trilingual Cuneiform Inscriptions 1902, esp. pp 95ff, 206. ↑ Another photograph of the inscription. Wikimedia Commons has media related to Tushpa. 1 The Nagorno-Karabakh Republic is a de facto independent country, which is recognized by the international community as de jure part of Azerbaijan.